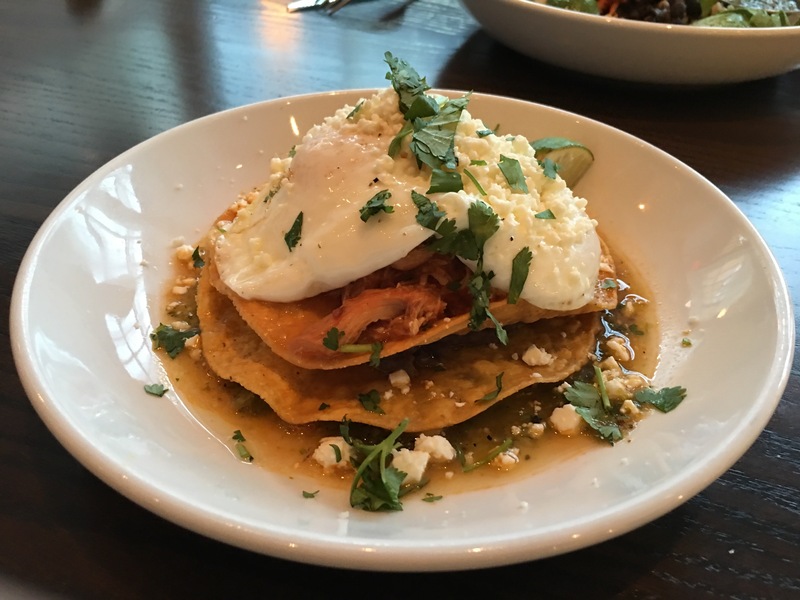 A Perfectly Impromptu Cincy Date Night – Go There. Try That. Last Friday our evening plans were unexpectedly canceled. Part of me wanted to stay in, take a gloriously long nap, put on pj’s, and bin watch episodes of The British Baking Show! Friday after work can be brutal. But, I knew my husband was looking forward to the grand opening of Braxton’s new Lab so I freshened my face, put on a cute outfit, and decided to make the best of a beautiful evening. I am so incredibly thankful I did because Friday night turned out to be THE BEST DATE NIGHT EVER and 99% was completely spontaneous. We started at Braxton’s new location which is connected to Party Source in Newport. It was packed! From what I hear, Ei8ht Ball Brewing used to house here. I’m not sure what it looked like then, but the bar area looks great and there’s a sweet back patio. 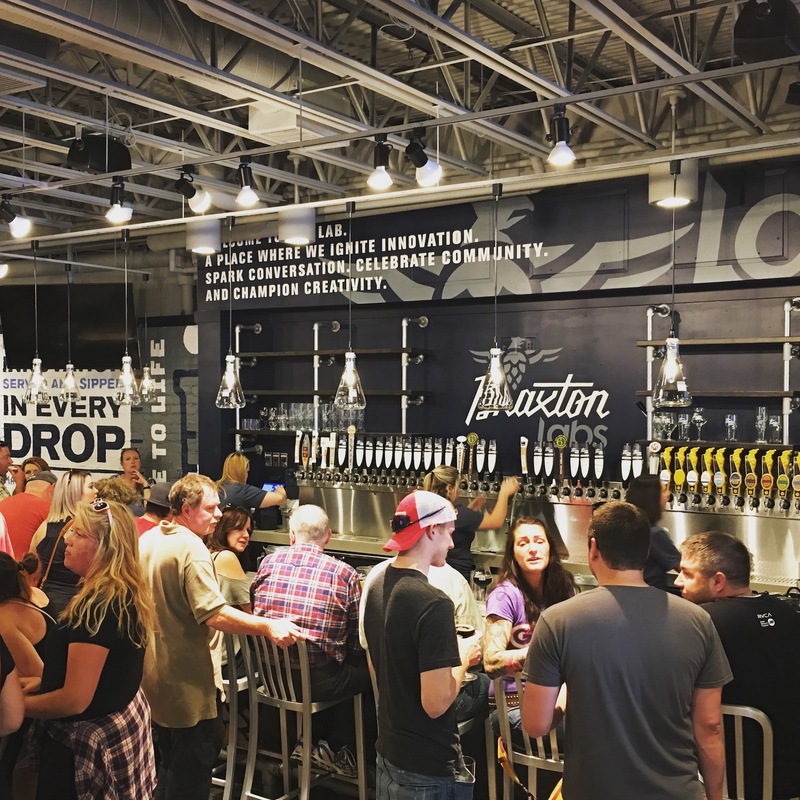 Because it’s a Brew Lab, you can find small batch beers from other breweries and Braxton beers not on tap anywhere else. 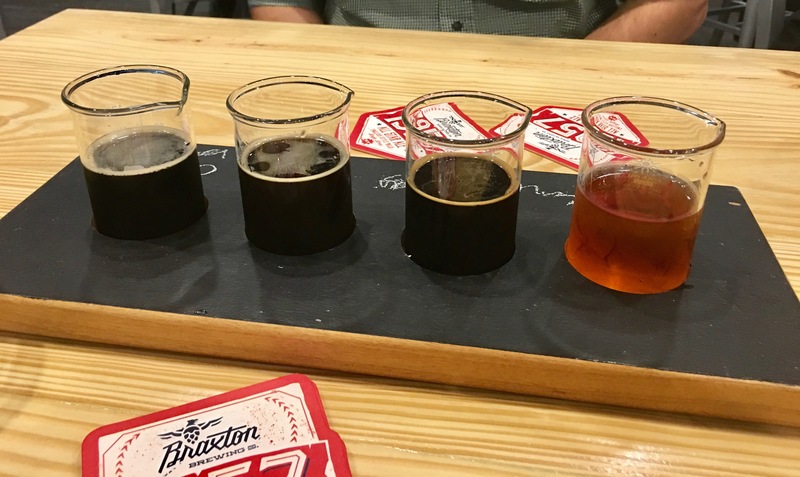 My husband enjoyed a vanilla coffee stout from Braxton and a flight of beers ranging from mead to a barrel aged porter. If you like what you try, head inside the Party Store and pick it up! After that, we decided to head downtown in search of a new restaurant. We parked in a garage, walked around for a while, and stumbled upon The Booksellers on Fountain Square. Ummm. I’m embarrassed that I’ve never shopped here before! We leisurely perused books, picked one to read together this summer, and grabbed a cup of coffee. It’s so nice to support live-in-the-flesh-brick-and-mortar-not-online bookstores! Plus, we got a recommendation from a staff member and avid reader. The first summer read from The Booksellers. By that time, we were hungry! I’d heard wonderful reviews of Maplewood Kitchen and Bar so we walked there in hopes of an open table. While this farm-to-table restaurant is beautifully decorated in sophisticated neutrals and all these interesting little details, it’s not the least bit pretentious. It’s like elevated fast casual. 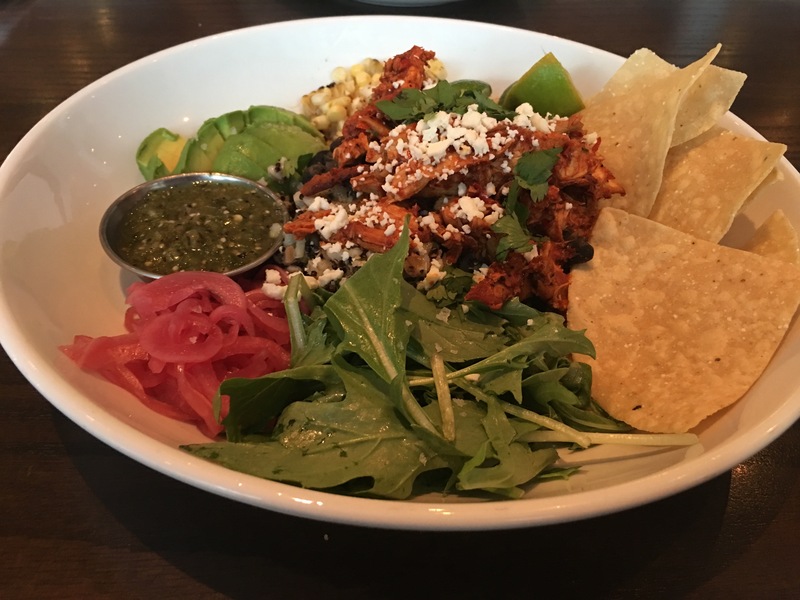 We enjoyed every bite of our Chicken Tinga and Guajillo Chicken Bowl. Each bite was fresh, savory, and packed with flavor. Trying to work off the decadent Cornflake Cookie we shared as an appetizer (don’t judge), we walked to the 21C Museum, which is always free, and decided to check it out since the art rotates quite frequently. Holding hands, we discussed paintings and sculptures . . . until . . . we caught a glimpse of the Streetcar! Literally, we ran down the steps of 21C to catch a ride! I kind of have a small obsession with trolleys and trains so why not streetcars? 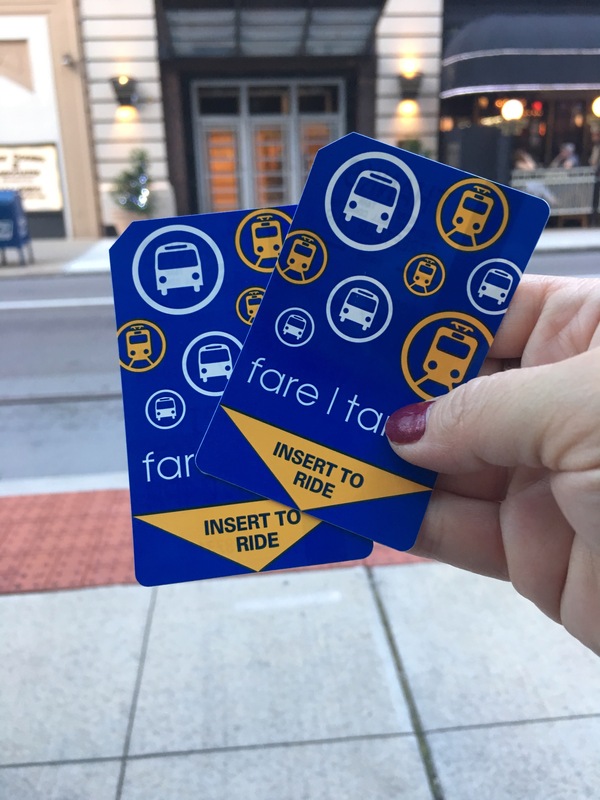 The Streetcar stops at all major locations in the downtown/OTR area (Washington Park, Findlay Market, the Banks, Fountain Square, etc). First time riding the streetcar! We hopped off at Washington Park because even though we didn’t know what was happening, we could tell something was going on. Turns out there was live music surrounded by food tents. 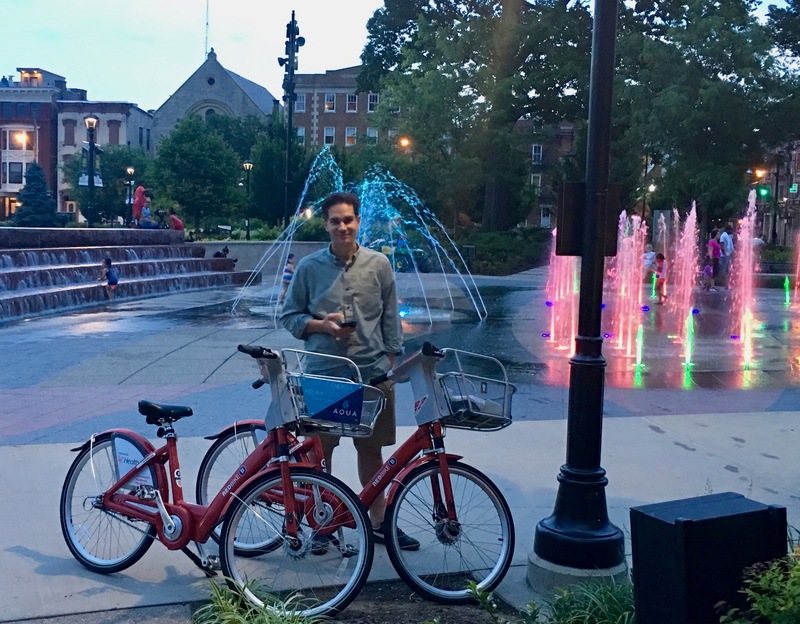 In the spirit of being spontaneous, we rented Red Bikes to cruise the park. Such a blast! We probably road those Red Bikes inside and outside the park 10 times. We even rode through the water fountains which were all lit up in the dusk. 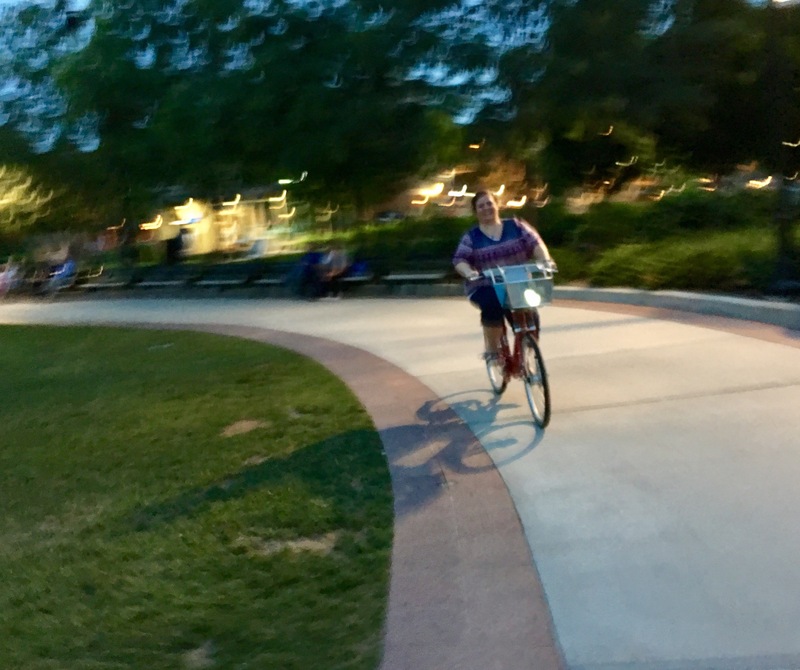 If you’re at all worried about these bikes, like I was, they are sturdy and easy to ride! Plus, you can pick up a bike in one location and return it in another! Physically tired and emotionally invigorated, we caught the Streetcar, rode the entire loop, and got back off at Fountain Square only to find New Kingston performing live! This reggae band delivers quite the concert (and again, this was free)! Be sure to check out the upcoming events- there’s even a trivia night?! What?! Wave to me June 5th, because I will be there! I love this city! Seriously love it. Cincinnati offers so much if you’re willing to explore! As I’ve said many times, I am always a tourist. I’m still smiling from this date night and so very thankful I didn’t take that nap and put on those pajamas. Every single thing we did Friday was new, was an adventure, was an experience. GO THERE (Downtown)! TRY THAT (Exploring Spontaneously)! Sounds like lots of fun! Great blog! Thanks, Mary! I hope you’re doing well! Too funny! I thought I recognized you when you came into the Booksellers on Fountain Square (now I know its from reading your blog! 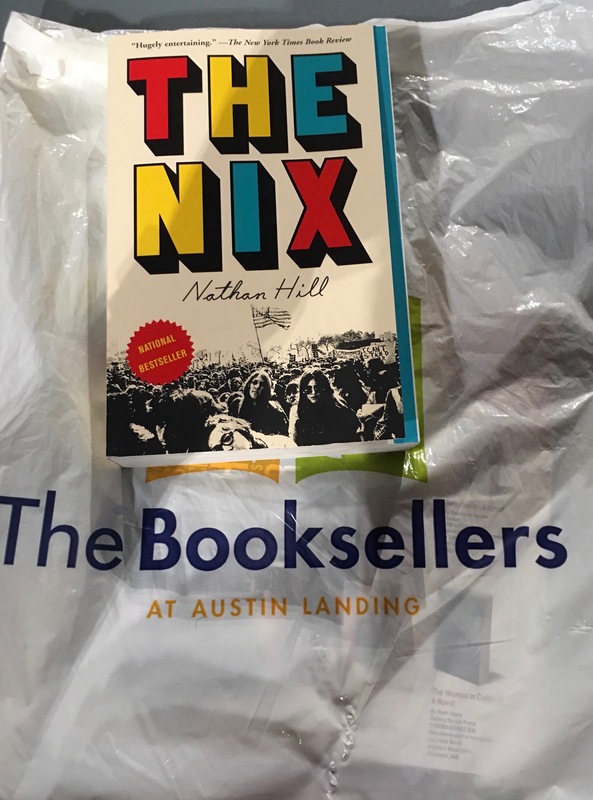 )…I’m the gal that chatted up The Nix! Hope you guys like it (& am happy to recommend others). 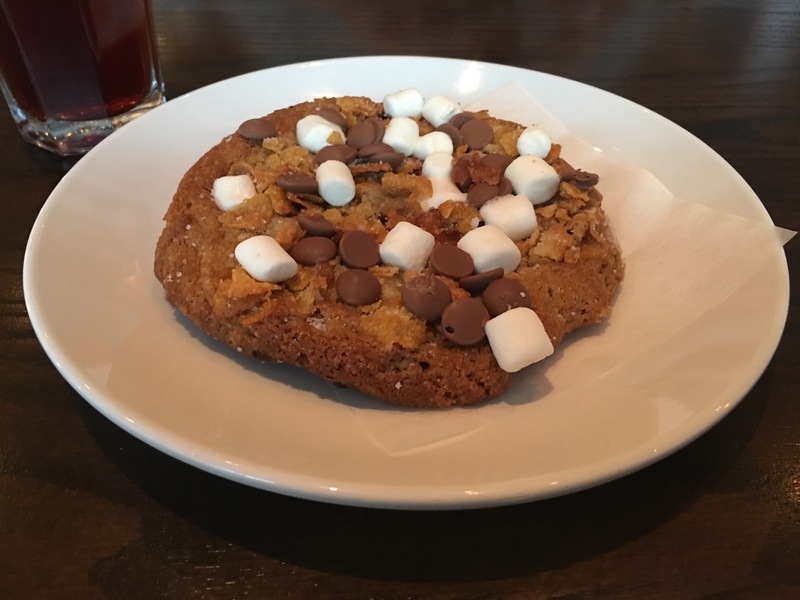 And, love that you had the cornflake cookie from Maplewood as an appetizer…I LOVE that cookie! Kimberly!!! Thanks for the book rec AND the food suggestions! I look forward to coming back to the Booksellers. Thanks for reading my blog- that excites me! I will make my next book trip there! Sounds like a wonderful night of making memories! It definitely was! Still makes me smile!